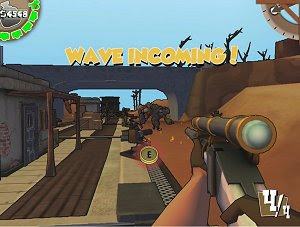 Bullet Train is a freeware first-person shooter set within a train in the good old west. The gameplay mixes FPS and tower defense genres, with the fallen enemies providing us with coins to purchase new weapons and turrets and also upgrading them. This is another quality game developed by a team of students, in this case from the Full Sail University. The cel-shaded 3D desert is easy on the eyes and the enemies are varied, from spiders to walking cactus and vultures.